In 1871, the colonial regime passed the notorious Criminal Tribes Act. This law was based upon the racist British belief that in India there were entire groups and communities that were criminal by birth, nature, and occupation. The Act unleashed a reign of terror, with its systems of surveillance, police reporting, the separation of families, detention camps, and forced labour. More then six decades after independent India repealed the Act, the “denotified tribes” continue to suffer from stigma and systemic disadvantage. The Act was one strand of a web of colonial laws that dehumanised communities and ways of life. The colonial administrators were particularly concerned about nomadic and itinerant communities, which by virtue of their movements and lifestyle were difficult to track, surveil, control, and tax. Through laws such as the Criminal Tribes Act, and other legal weapons such as vagrancy laws, the regime attempted to destroy these patterns of life, by using criminal laws to coerce communities into settlements and subjecting them to forced labour. Independence brought with it many changes, but also much continuity. Despite the birth of a Constitution that promised liberty, equality, fraternity, and dignity to all, independent India’s rulers continued to replicate colonial logic in framing laws for the new republic. They continued to treat individuals as subjects to be controlled and administered, rather than rights-bearing citizens. One of the most glaring examples of this is the Bombay Prevention of Begging Act. The Begging Act was passed in 1959 by the State of Bombay, and has continued to exist in as many as 20 States and two Union Territories. But last week, in a remarkable, landmark and long overdue judgment, the Delhi High Court struck it down as inconsistent with the Constitution. What does the Begging Act do? It criminalises begging. It gives the police the power to arrest individuals without a warrant. It gives magistrates the power to commit them to a “certified institution” (read: a detention centre) for up to three years on the commission of the first “offence”, and up to 10 years upon the second “offence”. Before that, it strips them of their privacy and dignity by compelling them to allow themselves to be fingerprinted. The Act also authorises the detention (the state of being detained in official custody) of people “dependant” upon the “beggar” (read: family), and the separation of children over the age of five. Certified institutions have absolute power over detainees, including the power of punishment, and the power to exact “manual work”. Disobeying the rules of the institution can land an individual in jail. Not only do these vague definitions give unchecked power to the police to harass citizens but they also reveal the prejudices underlying the law. The pointed reference to “singing, dancing, fortune telling, performing or offering any article for sale” makes it clear that the purpose of the Act is not simply to criminalise the act of begging (as commonly understood), but to target groups and communities whose itinerant patterns of life do not fit within mainstream stereotypes of the sedentary (tending to spend much time seated), law-abiding citizen with a settled job. And the reference to “no visible means of subsistence and wandering about” punishes people for the crime of looking poor — but it also reflects the lawmakers’ desire to erase from public spaces people who look or act differently, and whose presence is perceived to be a bother and a nuisance (a person or thing causing inconvenience or annoyance). 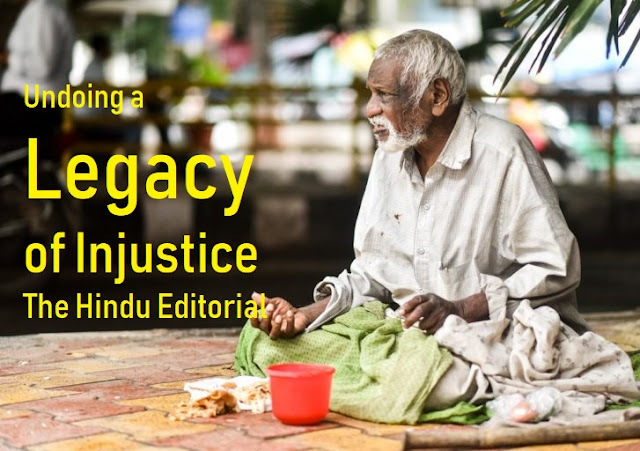 The Begging Act encodes into law the vicious prejudice that recently saw a prominent institution putting up spikes outside its Mumbai branch, to deter (prevent the occurrence of) rough sleeping (they were removed after public outrage).